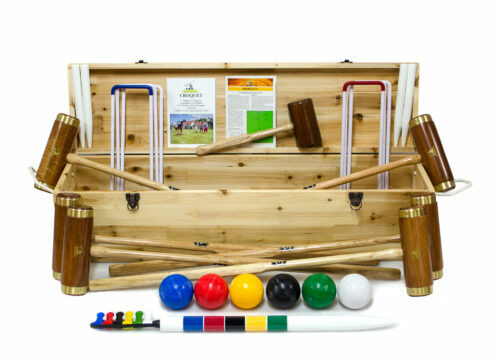 Hurlingham Croquet Sets - Superbly crafted traditional style mallets. 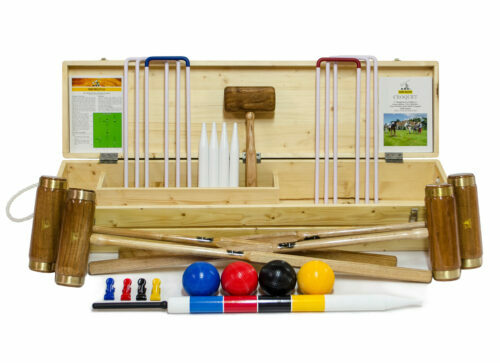 For the avid home garden croquet enthusiast, the Hurlingham set ticks all the boxes. 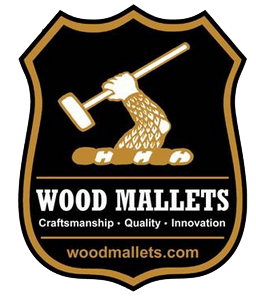 Superbly crafted traditional style mallets with turned English ash handles and octagonal shaped grips. The cylindrical heads are made from a super tough hardwood and have brass binding at each end to eliminate splitting of the end grain. Supplied with regulation weight 1 pound composite match balls and solid 11mm thick powder coated steel hoops. Each set also has a set of powder metal clips, four corner pegs, in centre peg a hoop mallet for knocking in the hoops, a laminated rule card as well as a 24 page colour rule book with tips and tactics. Available in both four and six player sets they’re packed in beautifully made solid pine storage boxes. For anyone who understands the intricacies of croquet, they’ll know that it’s a serious game and demands serious equipment. Sets like this can only enhance the enjoyment of every game. Amazing quality and a great price.